Black Death opens during the spread of the black plague. A team of ruffians follow a monk to a rumored land free of plague and pestilence. Enter Osmund; a young monk torn between his love for God and his love for his childhood friend and love interest, Averill (played by Kimberly Nixon). Osmund is chosen to lead this band of marauders into the wilderness chasing a legend. During the journey to come, they encounter all manner of misfortune and witchcraft as they combat the forces of evil throughout their land. Starring Eddie Redmayne, John Lynch, Tim McInnery, Kimberly Nixon, Andy Nyman, and Lord of the Rings’ Sean Bean. First off, to alleviate several misconceptions: Black Death is neither an action film nor a gore-ridden horror movie. The film contains several gross-out scenes, none of which are severely graphic. 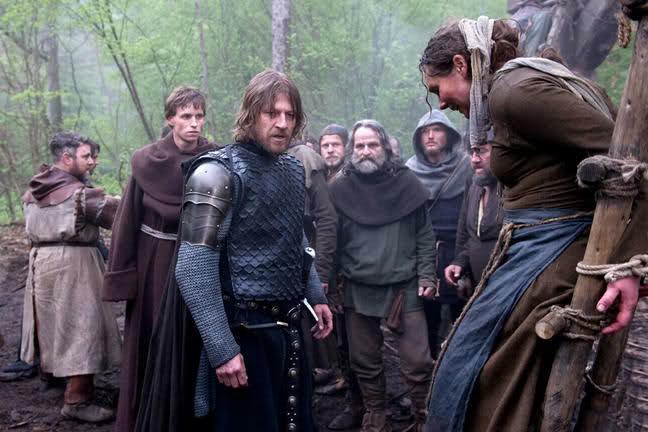 Second, the film does star Sean Bean, even though he does not have a lead role. His character Ulric serves as the distant leader of the group and mentor to Osmund who instead plays the lead. Strangely, the film still tends to advertise Bean as the film’s center because of the actor’s considerable Hollywood fame. This has brought considerable attention to the film which can only be described as a B movie. Even though not in the lead role, Sean Bean still manages to often take center stage and is the one character who everyone will remember the most for his interpretation of the classic action hero: gruff, wise, and perfectly capable of being a badass every time he is on screen. Technically, the film lives up to and at times exceeds the mediocrity that is common of a B-Movie, ultimately perching Black Death on a level slightly higher than one would expect. The Director, Christopher Smith, directs the film skillfully and with an amount of experience uncommon in this kind of movie. Smith, essentially, is the unseen star of Black Death. He is notorious for his spontaneous style. A style that gives both of the film’s action sequences and slow dramatic moments a genuine charm, one lacking in far larger productions. The screenwriter, Dario Polo(writer of Wilderness and Roseanna’s Grave) produces a screenplay that is very interesting in concept, but yet in execution doesn’t live up its full potential. The result is a film that isn’t significantly good, but is nonetheless a fresh new take on the tired genre of medieval horror. The high point of the film may possibly be the gritty realism that the film makers (insert name of director) brought to the screen. The film may be about knights and necromancers, but it somehow manages to feels tangible enough to suspend one’s disbelief to the point that one almost feels a part of this unfortunate fellowship. About a third of the way into the film, the scene erupts into what is the only major action set piece of the movie. The choreography is not flashy, not overly plotted or planned in any way. The scene feels spontaneous and dirty and what results is a level of realism rarely seen in a sword battle. Men fight, bleed, and keel over in anguish in a way that is more disturbing and believable than in nearly any film recently made. This style continues to carry the film through its entirety, bringing the reality of the black plague to life in a way that is rather disquieting and disturbing, but somehow not overloading the viewers with excessive gore or violence. 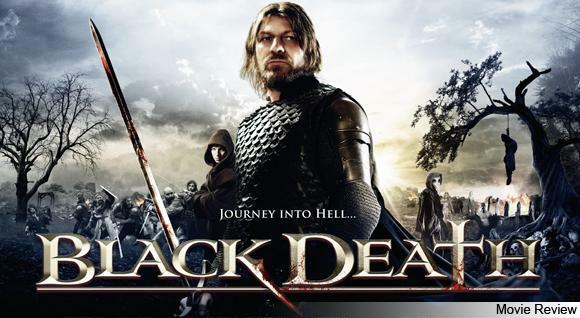 Black Death is a horror/action flick trying to be more. It attempts to branch out into the realm of drama films and even religion. What is presented, therefore is a slightly better, slightly darker, version of Season of the Witch seeing as it possesses an overall similar storyline. However, unlike Cage’s Season of the Witch, Black Death breaks free of the B-movie clichés that are so often present in films like these through its estranged ending. This isn’t your typical damsel in distress picture, and there is no couple getting married at the end. The film is actually bogged down by the reputation given to it by its own category. People watch it expecting giant action sequences and horrific displays of the black plague where in reality, Black Death is more of a drama; displaying the fellowship and mysterious journey of this band of lost souls. This isn’t a bad thing, in fact it gives the film a leg up over its mindless kindred and elevates it to a level where one can enjoy the gore without vomiting, watch the action without having a seizure, and even ponder the film and its message long after having viewed it.